Hirschmann offers a flexible line of fiber optic and copper SFP transceivers for your Ethernet products.Transceivers are available for Fast Ethernet, Gigabit Ethernet, 10 Gigabit Ethernet, and Bi-Directional Gigabit Ethernet. The Hirschmann line has a variety of different transmitter and receiver options available, allowing users to choose the correct transceiver for each link in order to provide the required optical reach over fiber when fiber is chosen—or the correct data rate and connection when twisted pair copper is used. The body size of SFP is about half of traditional GBIC, saving valuable operation space. Line Flexibility - Fiber, copper SFP transceivers are available. Bi-Directional models may also be selected. 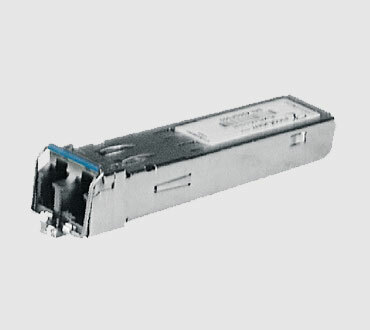 Fiber Flexibility - Both single and multi-mode SFP transceivers are available. Data Rate Flexibility - Fast Ethernet, Gigabit and 10 Gigabit units may be selected.